In our companion article, we discussed MTG Salvation user Talcos's new experiment in getting deep recurrent neural networks (or RNNs) to generate Magic: The Gathering cards. In short, Talcos is using a computer A.I. to notice patterns in a spoiler of every Magic card ever created, and is then using those patterns to generate new and interesting cards. These cards range from the crazy and overpowered, when the network is trained poorly, to the interesting and playable, when the network is trained well. We have scoured the original thread, looking through both Talcos's and other users A.I. generated magic cards, and picked out some of our favorites. 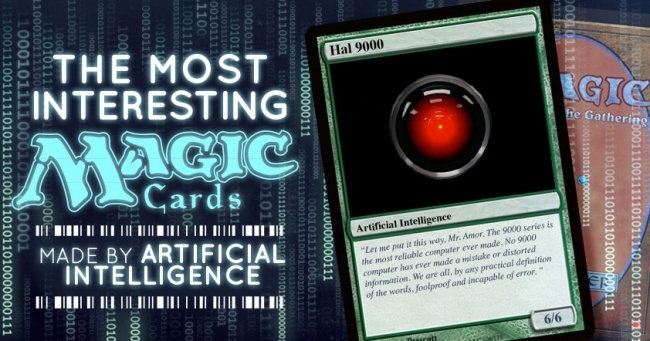 This is the first ever list of the most interesting Magic cards generated by an artificial intelligence. These cards were chosen not because they were interesting, but because they were funny and showed how little understanding the A.I. actually had of human created game concepts. Most of these are unplayable, if only because their rules make no sense, and many came from poorly trained RNNs or RNNs with their temperature set up too high, thus causing them to innovate on what can go into cards a little bit too much. Most of these also show off the hilarious tendency for RNNs to create new keywords too. Slidshocking Krow was the originator of tromple, which became something of an inside joke among the Magic RNN crowd. Tromple, oddly enough, kept showing up as a keyword on subsequent cards, and everyone was curious as to what it did. 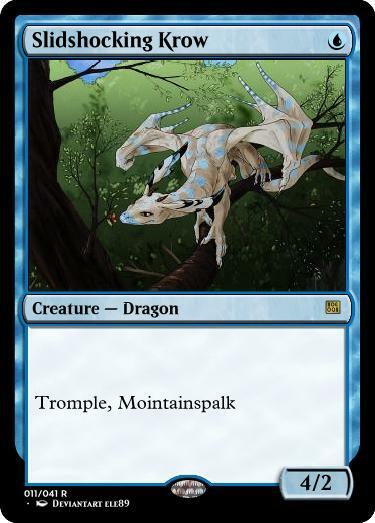 It wasn't until a later card was generated that we figured out. Even so, a 4/2 for U with no abilities is ludicrously overpowered, but the RNN was only trained for a few hours at this point so it had little understanding of power. This is an artifact that exists solely to rub salt in your opponent's wounds. Did you win the game? Gain 4 life anyway! I guess this would have some actual use in a gigantic free for all multiplayer game.